As many of you are aware, I am not only a photographer but I am also a writer. Most of my stories are human interest stories that appear in the Ludington Daily News. They are typically stories of local people. I love these types of stories. One of my very first interviews back in 1989 — when I was a stringer for the Daily News — was of Edgar Struble. Edgar is from Scottville and at that time he was Kenny Rogers’ music director. What I admired about Edgar then and now, is that he never forgot where he came from. During that time he owned several buildings in Scottville and Ludington and he returned frequently to visit his father. Even with his father gone, Edgar still returns to Mason County often. In California, where he now lives and works, he writes and produces music. Often, he will hire musicians who also have Mason County roots, including Luke Rangel (a producer) or drummer Brian Burwell. When he comes home in the summer, he puts on free concerts in Scottville and Ludington featuring several local musicians. Another person who I admire is Harold David Cronk. Cronk grew up in Scottville and majored in art in college, earning an education certificate. But, the teaching gig wasn’t his thing. He wanted to create movies. So, he and his wife, Amy, moved out to California. After-all, that’s what you have to do if you want to make movies, right? Wrong. After several years there, the Cronks made their way back to Mason County and Dave and a business partner opened 10 West Studios in Manistee (reference to U.S. 10 highway that runs west to east through the heart of Mason County). It hasn’t been easy, but 10 West has produced a few films in this area and is committed to filming more. The last few days I have had the privilege to observe, photograph and write about the filming of 10 West’s latest production, “Mickey Matson and the Copperhead Conspiracy.” This movie is being exclusively filmed in Mason and Manistee counties. Once again, Edgar has seen something in a “local boy” and has invested in the film, giving him the title of Executive Producer. A wise investment, indeed. The crew on the set, most whom are basically freelance or contracted, are saying this movie is going to be the big time for 10 West. I got to see a trailer today and I have to agree. Good job guys! I can’t speak for everyone but I am proud of our Scottville boys. Above, shooting on Manistee Fifth Avenue beach. 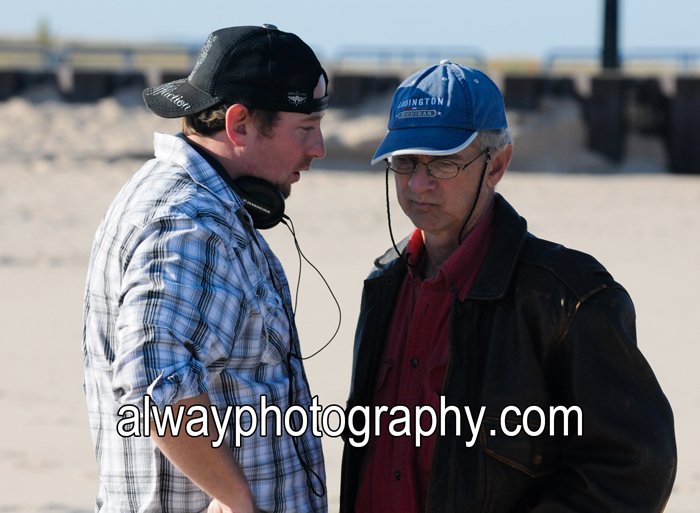 Below, Cronk, left, talks with Struble during filming in Manistee.